Ubuntu Unity 11.04 is out for everyone now. The Unity interface is a huge overhaul and has a ton of new features and keyboard shortcuts. If you are a power user or want to be one, knowing keyboard shortcuts (or atleast having them close by) is a surefire way to that. 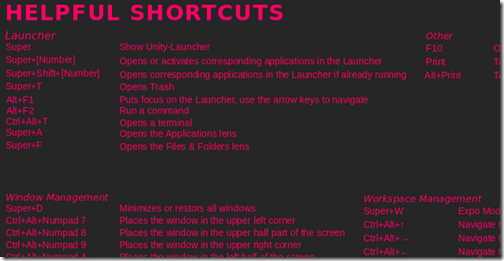 AskUbuntu has created a nice wallpaper with the Ubuntu Unity keyboard shortcuts. 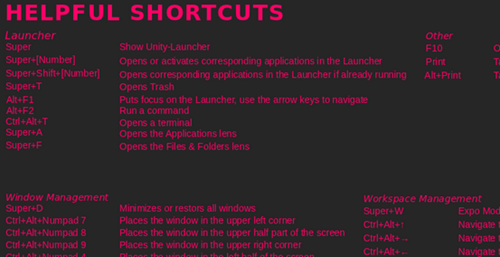 You can download the wall paper that has an overlay of all the keyboard shortcuts over the default Ubuntu wallpaper. Check out this thread for text version of these shortcuts and other wallpaper options. I hope to have more such tips and tricks in the Linux section in the coming weeks.